The town of Nazca, located on a high, desert plateau about 7 hours from Lima doesn’t have a lot going for it. There is a good chance it would be completely overlooked by Peru travel tourists and backpackers if it wasn’t for the famous Nazca Lines nearby and the other archaeological sites that accompany them. Discovered in the early 1900s, the Nazca Lines consist of hundreds of geometric, animal, and human figures drawn into the desert floor. These lines were created by the ancient Nazca culture which thrived between 400-650 AD. The lines vary in complexity and include figures such as hummingbirds, monkeys, fish, lizards, spiders, trees, and humans. There are also hundreds of geometric shapes and long, straight lines of up to 37 miles in length. Plenty has been learned about the lines and the Nazca people but there is still no definite conclusion on why the Nazca built the figures and shapes. One theory suggests that the figures represent star constellations. Another theory suggests the lines are linked with the flow of water, from the surround mountains, which was extremely important to this ancient desert culture. Despite not knowing for sure why the lines were created, archaeologists have learned a lot about how the lines were made. The desert floor of the Nazca plateau is not made up of sand but rather hard, red stones. These stones were simply removed by the ancient Nazca people, exposing the white, lime earth underneath. Most lines consist of, at most, a 6 inch deep trench were the stones were removed. Evidence has been found that the Nazca builders used simple grid systems to map out the figures and geometric shapes before removing the stones. The constant, and relatively windless, desert climate has nearly perfectly preserved the Nazca Lines. Unfortunately, most damage in the past 100 years has been from tourists taking “souvenirs” and tour agencies driving vehicles over the lines. As with nearly all ancient, man-made wonders, Nazca is plagued by alien contact theories. Most of these stem from the large size of the figures and shapes and the fact that they are so hard to see from the ground. While it is true that an aerial view offers the best look at the lines, no alien theories have even come close to providing real evidence of anything. 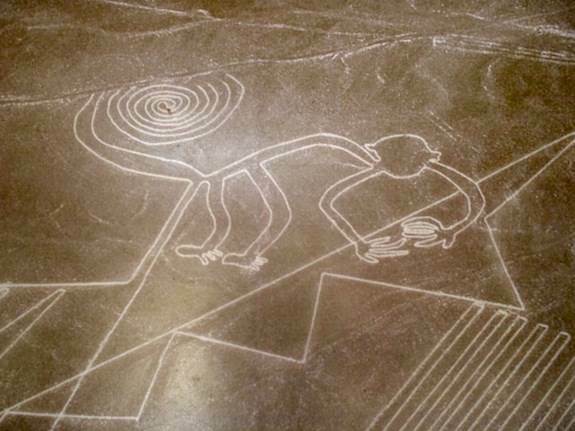 Instead of following the alien theory, I’d suggest stopping by one of the local archaeological museums to learn more about the real people behind the great Nazca Lines. 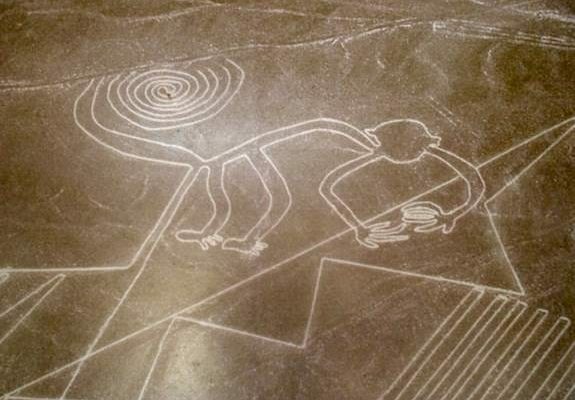 Most people coming to see the Nazca Lines are more interested in the show than the history lesson behind it all. Fair enough, you are on vacation, so here is how to go about seeing the lines. The most popular option, and the better one by far, is to see the lines by air. The grand scale of the Nazca Lines just can’t really be comprehended until you are in a plane, thousands of feet up, flying over them. In Nazca you will no doubt encounter plenty of touts offering you “special deals” on flights but your best bet is to head to the local airport yourself. Each company has a booth and you can easily shop around for the best price. In general, plan to pay between $50 and $90 for a seat in a four-seater plane. High season is the only time flights ever book up and in most cases you can easily caught a flight at any time between 7am-4pm. Don’t expect a nice modern jet though. 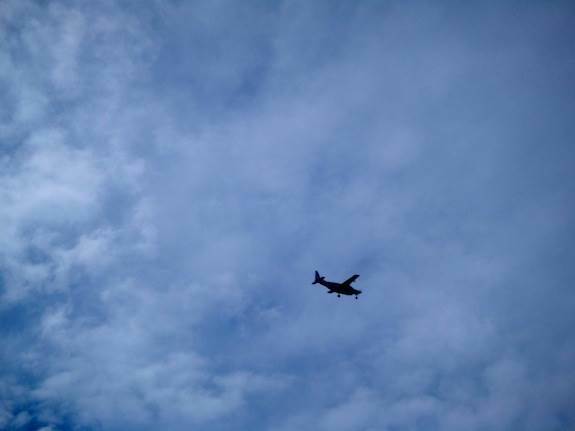 These are bare bones, basic, short distance planes that fly countless hours each year. In general the flights are very safe, the planes looked after, and the pilots well trained. As always though, use your best judgement and if a plane or pilot doesn’t look safe to you, don’t get on. If you are on a budget and can’t afford a flight, you can still see a bit of the Nazca Lines by climbing the observation tower. The trip out to the tower (by local bus) and the 2 soles to climb it, make this option super cheap. The tower only gets you a few feet off the ground but it is enough to get the basic outline of three of the figures. Your photos wont be as good, but this is a much more up-close-and-personal way to see the lines. There are also a few lookout points from local mountains were you can see some basic shapes and geometric figures.